Juvenile soft-shell "steamer" clams are not surviving to adulthood due to high levels of predation, according to Brian Beal, a professor of marine ecology at the University of Maine at Machias and director of research at the nonprofit Downeast Institute (DEI), who partnered with the Maine Clammers Association to conduct the research. The team discovered that post-settlement mortality of soft-shell clams, Mya arenaria, is as high as 99 percent in southern Maine, putting the state's iconic soft-shell clam fishery in jeopardy unless major changes in resource management occur. Statewide, clam landings have plummeted in the past 30 years, with 2017 landings the lowest since 1930. During the same time period, seawater temperatures in the Gulf of Maine have risen substantially and winters in the region have become milder. During this period of warming ocean temperatures, populations of invasive green crabs, Carcinus maenas, have increased rapidly in Maine, especially along the southern Maine coast. DEI's experiments were designed to disentangle the drivers of the clam decline. Six large-scale field experiments, which excluded predators such as green crabs, were deployed in three tidal estuaries in southern Maine over the course of two years. Two of the experiments, conducted in Freeport, were part of the largest intertidal research project in state history. "These studies reveal just how severe predation on soft-shell clams is," Beal says. "The major predators are invasive green crabs, especially small crabs that feast on juvenile clams. But even native species such as milky ribbon worms are having a significant impact on clam populations. "Results suggest that current predation rates are so severe that less than 0.01 percent of juvenile clams survive beyond their first year," says Beal. This means that most clams are being killed by predators before they can reach commercial sizes." The invention and deployment of a "recruitment" box that collects and protects settling clams and other species provided researchers with a previously unseen look at the current productivity of southern Maine's intertidal ecosystem. Analysis of the contents of the recruitment boxes clearly showed that post-settlement mortality, rather than a limited supply of available clam larvae, was the most important factor in current clam populations. The research was recently published in the April edition of the Journal of Shellfish Research, a publication of the National Shellfisheries Association. It is co-authored by members of the leadership of the Maine Clammers Association. 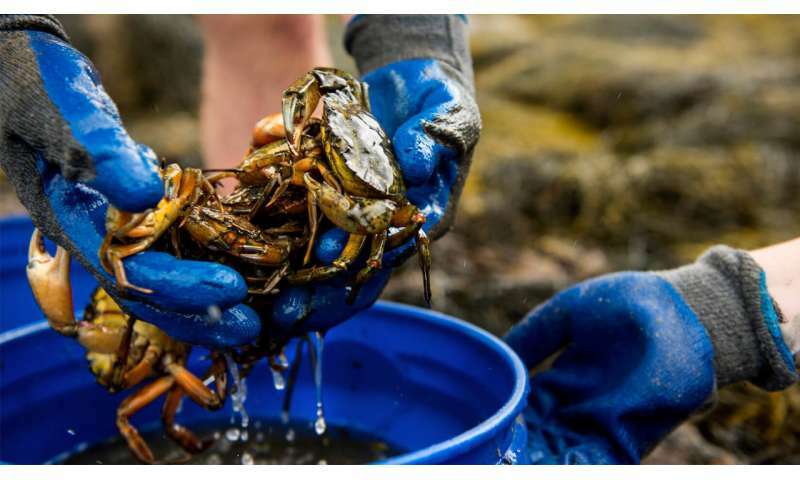 "These dramatic results indicate that we need to rethink the current shellfish management methods used in Maine, which were invented when seawater temperatures were colder and invasive green crab populations were scarce or absent," says Beal. "These methods no longer work in a warm water environment that is being dominated by voracious shellfish predators. "Since most scientists predict the warming trend to continue, management efforts need to adapt to present environmental and biological conditions or risk watching the fishery decline to levels that are no longer commercially viable," he says. The research suggests that new clam management measures need to focus on increasing the survival of juvenile clams that settle on the mud flats. These include instituting a maximum size law to protect the larger clams which produce more spawn and, thus, offer a greater chance for juveniles to survive predation. Similar maximum size laws exist in both the lobster and sea urchin fisheries. In addition, setting up rolling two- to three-week regional coastal harvesting closures from west to east during late May through early July would allow clams to spawn before being harvested. "At the same time, certain commonly used 'clam conservation' activities should be abandoned," Beal says. "For example, 'brushing,' which serves to create habitat for green crabs so that any increase in clam settlement results in feeding green crabs, and planting or transplanting clams without adding predator protection are activities that no longer provide the benefits they used to in the current predator-dominated environment."